Welcome to the home page for Cobble Cottage. Dent Holidays offers you the opportunity to stay at the family and pet friendly Cobble Cottage in Dent, Dentdale, near Sedbergh, Cumbria; in the Yorkshire Dales. Cobble Cottage is situated in the very centre of the picturesque village of Dent in the outstanding Yorkshire Dales; neighbouring St. Andrew's Church. Dent is set in the stunning, secluded valley of Dentdale which is central to the most picturesque areas of the Yorkshire Dales and The Lake District. Cobble Cottage sleeps up to 4 people; 1 dog is allowed*. The cottage is suitable for families with children and we do provide a high chair, bouncy chair and travel cot for babies and toddlers. Visit our prices page for the latest pricing information. Dent is only 15 minutes form the M6; making it easily accessible from the North or South. Dentdale stretches from Sedbergh in the West to Dent Head in the East, near to the Hawes to Ingleton road. The Dentdale scenery is unique, created by the famous Dent Fault that has divided the Dale into two, leaving a typical Lakeland (younger) landscape to the West and a more rolling Dales-like (older) countryside to the East. Adam Sedgwick, the so-called father of geology, hailed from Dent, learnt from the fault and determined its origin. Dent Fault runs from Garsdale across into Dentdale. Dent is rather unusual in a political sense (the geographical term) as it is in the county of Cumbria and in the Yorkshire Dales National Park. The whole of Dentdale is inside the Yorkshire Dales National Park. Both Dent and Sedbergh used to be in the West Riding of Yorkshire; they are now in Cumbria. Dent is is a corner of Cumbria that neighbours North Yorkshire and Lancashire. This means that towns like Sedbergh, Kendal, Kirkby Lonsdale, Hawes, Ingleton, Carnforth, Lancaster and Morecambe are within easy driving distance. Staying at our self catering holiday cottage in Dent means you can visit the Lake District, Yorkshire Dales and even the North York Moors by car. Equally you can walk or bicycle around Dentdale and the surrounding dales and area. The accommodation offers a sound base for most activities, including: walking, cycling, fishing, driving and touring. Registered guests and users have access to special pages that list activities, things to do and other interesting topics. Guests can also leave reviews, suggestions and add to the activities and things to do lists. *Generally we accept one dog only; with consent and payment of a security deposit of £25 per pet 2 dogs will be allowed. Please see the pricing page for details. 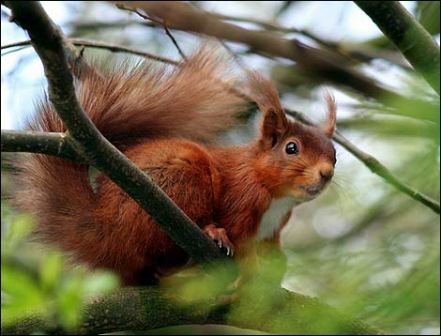 Yes, there are red squirrels in Dentdale. So why not come and stay with us for a chance to see them? No promises, but, they are around. A guided walk to a visitor centre starts in Hawes. Feeding stations are located within Dentdale. On the way to Hawes you will either pass Dent station or drive through the Dentdale Head viaduct of the famous Settle-Carlisle railway line. Yes, there really are Red Squirrels in Dent. We drove back from Hawes at the of May  and soon after passing through the Dentdale Head viaduct (Settle - Carlisle line) I had to break hard because a Red Squirrel was on the road in front of us! A Dent [human] resident tells me that Red Squirrels can often be seen in the Sun Inn car park; very close to Cobble Cottage. Here's an article in The Yorkshire Post about Red Squirrels in Dentdale and the surrounding areas.